Charter Oak Mechanical installs new air conditioning units and repairs all air conditioning models. We are a reliable and trusted company that has an A+ Better Business Bureau rating for over 25 years. We consider ourselves the experts in air conditioning. 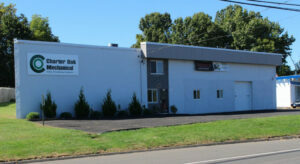 Charter Oak Mechanical is located in Manchester and services Windsor CT, East Windsor CT, South Windsor CT and all surrounding towns. We service homes, apartments complexes, condominiums and offices and commercial buildings. At Charter Oak we make sure that our technicians come prepared to install all the most popular brands and have the tools to make most repairs. We service American Standard, Lennox, Mitsubishi and much more. Please call for estimates and more information. We are always available to service your needs.